Not only can you play Tetris, but you can eat it, too! Breakfast is often referred to as the most important meal of the day, and while everyone has his or her own preferences, pancakes remain a huge favorite. These tasty breakfast treats are the perfect way to start your day off right, or to eat as a snack during your daily Tetris marathon! With that in mind, and if you’re a fan of both pancakes and Tetris, why not combine the two? Adding a little Tetris flair to your pancakes is easier than you might think. 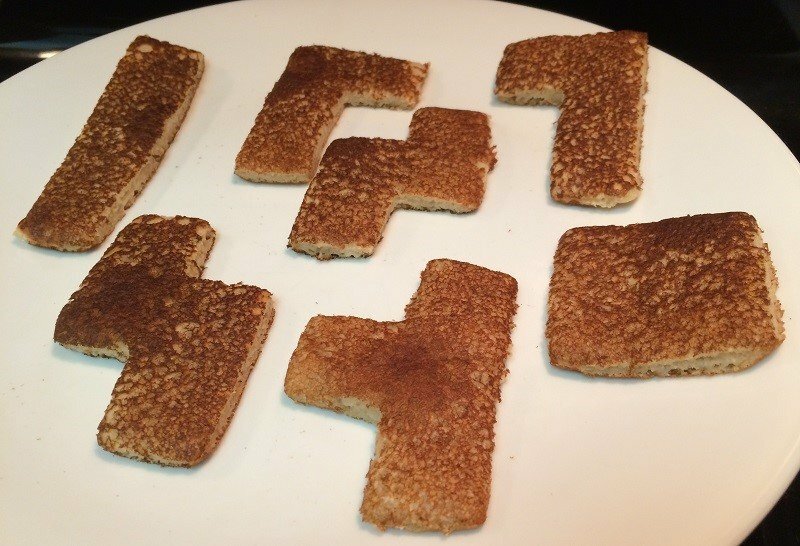 Once you have your supplies, you can begin the process of making Tetris pancakes. First, you’ll need to grab a clean frying pan and grease it with either nonstick baking spray or butter depending on your personal preference. Next, place the frying pan on one of your stovetop burners and set the temperature to the lowest setting. Keep in mind that you want to gradually warm your pan as you prepare your pancake mix, not burn the butter/spray. With your pan warming up, take your box of pancake mix (or listed ingredients from a recipe like this one) and mix everything together in a bowl. Once your pancake mix is ready, head back over to your frying pan and increase the heat to medium-low heat. Using a measuring cup, pour out a half cup of pancake mix into the center of your frying pan. As your pancake cooks, keep an eye out for bubbles on the surface, as this will let you know it’s time to flip it over and cook the other side. Another tell is when the edges become a soft, golden brown. Next, cook the other side of your pancake, checking occasionally to ensure that it’s cooked to your liking. Whether you prefer a soft, fluffy pancake or a crispy pancake, how long you choose to cook both sides is entirely up to you! After each pancake is finished, place them on a clean plate to cool off. With your stack of pancakes complete and cool enough to handle, take your Tetris cookie cutters and gently cut out each Tetrimino. With all of your Tetriminos cut out, you can arrange them on the plate and use it as your Tetris Matrix! Try to avoid putting syrup on your Tetrimino pancakes until after you’ve finished playing breakfast Tetris, though, as you don’t want your hands to get sticky while playing your favorite puzzle game. 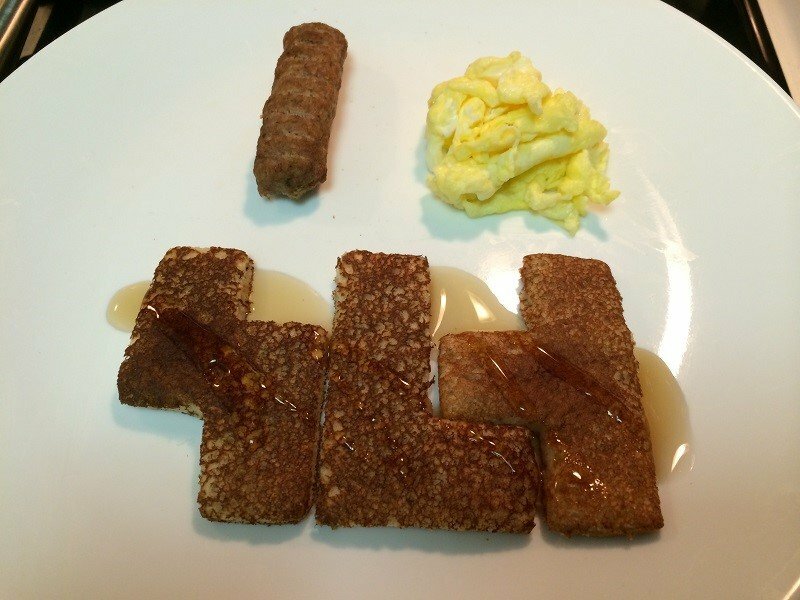 And there you have it, a tasty Tetris breakfast you can make for yourself every morning… or whenever you crave pancakes. With your pancakes ready to eat, why not celebrate your stylish breakfast by playing a few rounds of Tetris online, or keep your creative juices flowing by making your very own Tetris painting!